The South Beach Smoke Air® is a marvel of the highest electronic cigarette technology, created to take your vaping to heights never before seen. Developed with an ultra-powerful 350 mAh battery, it was made to go longer distances, give supreme power, and provide the most satisfying levels of vapor production imaginable. Designed to please even the most discerning of users, it was made for ultimately simple use, filling, and recharging without compromising any style points. Get ready for the freedom, get ready to feel the AIR! An attractive stainless steel finish paired with the slim lines of this vaporizer make it as beautiful to look at, as it is to use! 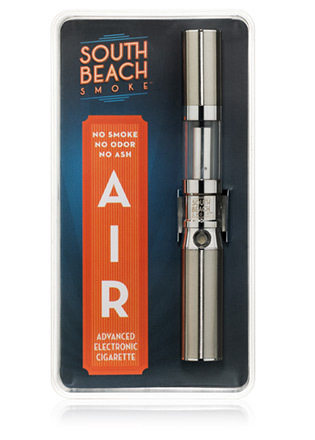 The South Beach Smoke Air® is palm-sized and only 4 inches long, but delivers extra-large sized performance. It has been designed with a battery that contains power like never before and a tank capacity that satisfies the most demanding vaper. 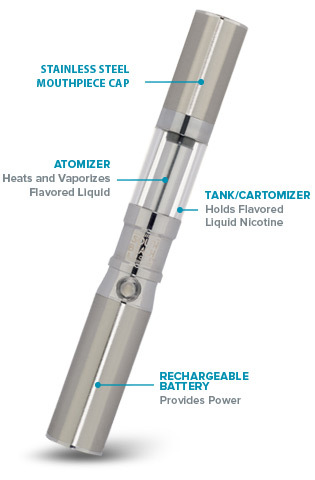 The Air's advanced tank system is infinitely easy to use and takes vaping to a whole new level. The top cap of the Air works flawlessly to keep your vaporizer free of dirt and dust! Vape with power, and vape with the best! We invite you to experience the South Beach Smoke difference; unparalleled performance and unmatched flavor intensity await you! Our e-liquids are of the highest quality available, both in how they are made, and what they're made of. Manufactured exclusively in the USA under the strictest manufacturing standards, in an FDA-registered lab, all of our formulas are on file with the FDA. We use only the best, Kosher-Grade ingredients, as well as the finest glycerin sourced from Malaysian palm. Available in over 50 different flavor varieties, our liquids are made to be custom blended so you have the ability to create nearly any flavor you could want. Between single shots, double shots, and blending up to 3 different flavors per blend, you've got 30,000 different tastes awaiting you! From classic tobacco to strawberry cheese cake, what's your flavor?